As I thumbed through an old family photo album I came across the first photograph taken using my very first camera. 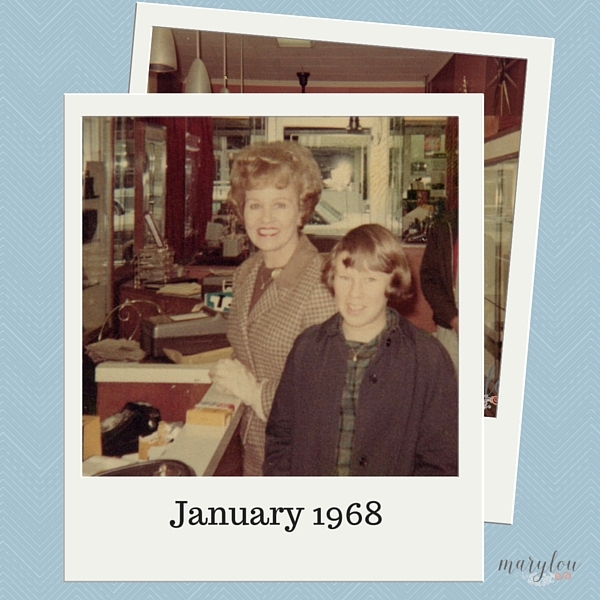 It’s a photo of my mother and me taken by the owner of a camera shop the day I bought it. The photo brought back memories of that day so vivid to me. Thought I’d share this little story. My Dad gifted me money for Christmas knowing exactly what I was going to spend it on, a camera all my own. I had heavily hinted months before Christmas that Santa could bring me a camera. It was 1967. I was 12 years old and I could hardly wait to go shopping for it. The rural Georgia town we lived in did not have a camera shop so that meant a shopping trip to Dothan, Alabama, 35 miles away. It was always a big deal to go shopping in downtown Dothan. Mom and I would make a special day of it. This particular day we got all dressed up (that was “normal” for shopping in those days). Mom wore her home-sewn brown wool tweed suit (straight skirt and fitted jacket) with a light brown cashmere sweater under the jacket. A classic broach adorned the jacket lapel and her signature bouffant hair was perfect. It was cold this time of year so she also wore her beige kid-leather gloves. Very stylish she always was. I wore one of my favorite dresses of blue and gray Scottish plaid also sewn by mom, while sporting my new blue London Fog coat [a Christmas present]. I can still hear the door chimes ring as we entered the camera shop, signaling a customer had arrived. Indeed, I had entered the building. It was a rather narrow shop. Huge cabinets filled with cameras and supplies lined the long walls. There were carousels for slides stacked next to projectors, old cameras waiting for repair and framed photos, some faded, hung on the walls all the way to the ceiling. It was walking into a shop of wonder and delight. Mom explained to the shopkeeper why we were there, as if there was any doubt due to my excitement. Smiling, he pulled out a bright yellow box from the glass counter, opening it to my wide eyes filled with thrill. 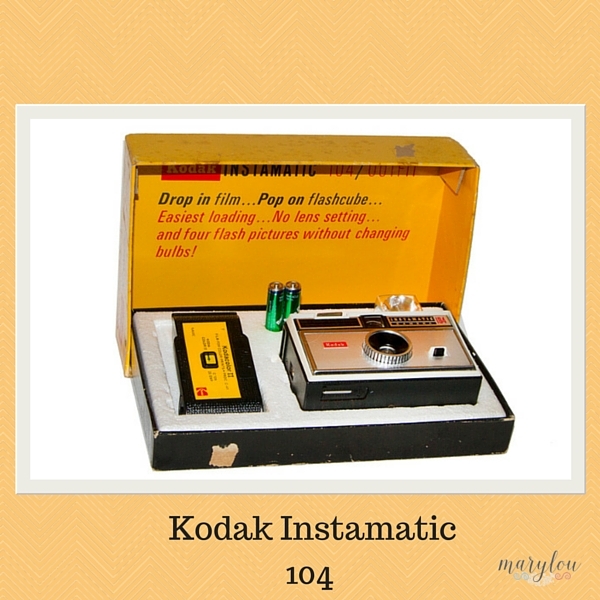 There it was, my first camera, a Kodak Instamatic 104 camera. It came with flash bulbs and film too. I distinctly remember those flashing blue bulbs popping light while rotating after each shot. He showed me all the features, explaining each one so I understood how to use it. I was ready to take my first photo. He started to hand me the camera, then hesitated and said, “Stand here next to your mother and I’ll take your picture for your first photo using your new camera.” I never thought about it much then, but now, looking back, what a clever idea. I will always remember getting my first camera because of this photo. I was quite the little photographer that holiday season. Drop the film in. Aim. Click. Flash. I went through film and flash bulbs like fine sand sifting through my fingers. I loved it. I never became a professional photographer but I certainly enjoy taking photos. Now I create digital paintings and digital scrapbooking of photographs, but that’s another story. I had the camera for years and simply don’t remember whatever happened to it. I do remember using it all the time though. One never knew when they would get flashed with those blue bulbs by a young blue-eyed gal.